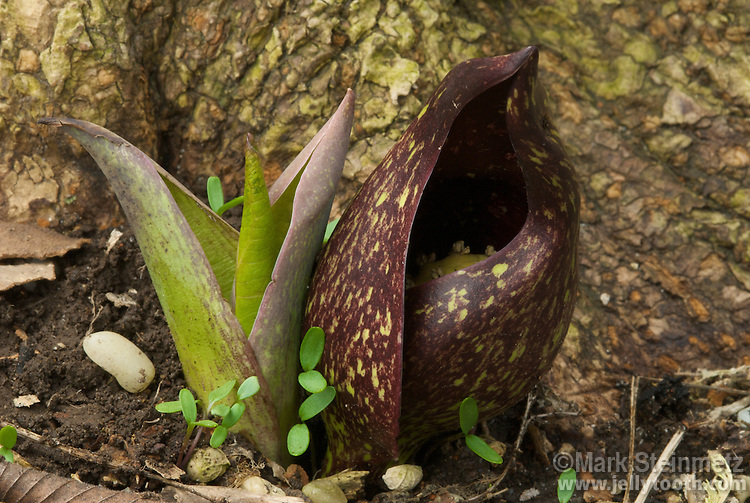 Skunk Cabbage (Symplocarpus foetidus) with its brownish-purple and green flower, and emerging new foliage. This species is native to eastern North America. So named because the flower gives off a fetid, foul smelling odor, similar to decaying flesh, which attracts insects that pollinate the flower. Found in wetlands and wet woods, one of the first flowers to bloom in early spring. Franklin County, Ohio, USA.